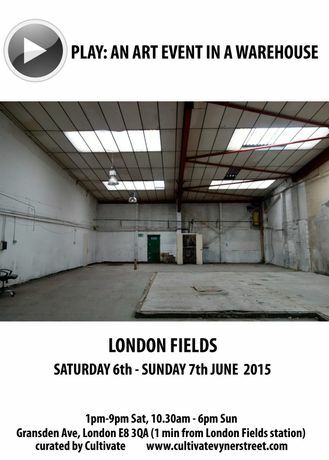 Cultivate presents PLAY, a two day maximalist art event in a great big beautiful shell of a soon to be demolished warehouse, just by London Fields, London, E8. Gransden Avenue, E8 3QA. One minute from London Fields railway station and right by Broadway Market, the field itself (and all that that involves on a summer weekend). Where were we? Cultivate, as far as Vyner Street is concerned, is now a flattened pile of rubble. Time to play…. Cultivate is evolving again, until we throw out an anchor and settle on a new space, Cultivate will roam around, pop up, do things in strange spaces, in not so strange spaces, conventional spaces, not so conventional spaces The next Cultivate event of will be an art exhibition called Play, a two day art show in a great big beautiful shell of a (soon to be demolished) warehouse, just by London Fields, a stones-throw from the railway station, London, E8. Expect painting, installation, sculpture and… well watch this space, all about artists coming together to make things happen. Play will happen on the weekend of June 6th and 7th. A gathering of pro-active artists who either showed work at Cultivate during the three year Vyner Street period or worked alongside Sean or Emma at other events in recent times.